Summer here in Australia is all about slowing down and enjoying the weather! A casual luncheon, outdoors, under the shade of the trees fits the bill perfectly. There is something special about switching off from the world and enjoying the company of friends around the table featuring easily thrown together food. Here we have the details of our staff luncheon as seen in Fete Magazine last summer, with delicious food cooked by our founders Vic and Emma for our small team plus a few extras. The sea breeze was blowing, tunes were playing... it really was a fun day! 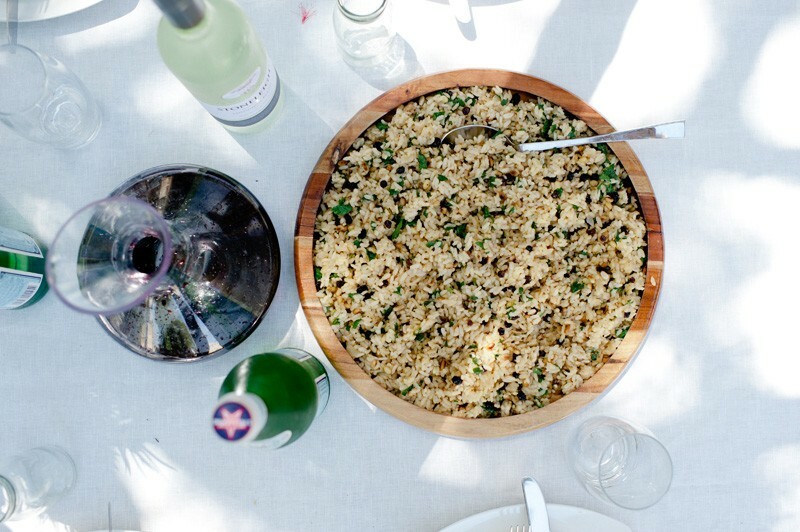 We wanted to share the recipes with you for inspiration for your own lazy summer lunch. Combine the chicken with the turmeric, chilli flakes and a pinch of sea salt and marinate in the refrigerator for 2 hours. Stir the cumin seeds in a dry frying pan over high heat until fragrant. Put the cumin seeds, garlic yoghurt, mint leaves, coriander leaves, parsley, tomato, onion, chilli, sea salt and black pepper in separate bowls. Sprinkle the pomegranate seeds over the parsley. Heat the olive oil in a frying pan and cook the chicken over high heat for 10–15 minutes, or until cooked through. Transfer the chicken to a bowl. Grill the flatbread until warmed through. Serve all the bowls in the centre of the table. Put a little of each ingredient into the warm bread and eat, while the juices run down your arms. Rinse the rice under cold running water, then set aside to drain. Heat the stock or water in a small saucepan. Melt the butter in a heavy-based saucepan over medium heat. Add the onion and sauté for 10–15 minutes, or until soft but not browned. Add the rice and cook, gently stirring, for 5 minutes. Add the hot stock or water to the rice and season with sea salt. Cook over low heat for 10 minutes, or until almost all of the liquid has been absorbed. Reduce the heat, cover and steam the rice for 15 minutes. Remove the rice from the heat and let it stand, covered, for another 15 minutes. Meanwhile, fry the pine nuts in a dry frying pan over high heat for 3–5 minutes, or until golden. Combine with the currants. Gently stir the rice with a fork to separate the grains and transfer to a serving dish. Sprinkle with pine nuts, currants and parsley. Cake- Preheat oven to 180 degrees. Grease and line 2 x 20 springform cake tins. Place the cacao in a medium bowl. Pour over the boiled water and whisk together well. Set aside to cool. In a separate large bowl, whisk together the olive oil, eggs, vanilla and rice malt syrup for 3 minutes or until thick and creamy. Pour over the cool cacao and mix. Stir through the almond meal and baking powder. Divide the mix evenly between the 2 cake tins. Bake for 30-40 minutes or until a skewer inserted into the centre comes out almost clean. Leave to cool slightly before turning onto cake racks. Cream- Take the chilled can of coconut ceramist of the refrigerator being careful not to shake or invert it at all. Carefully open the can and separate the hardened cream at the top from the liquid coconut water (if any) underneath. Discard water or reserve to use in another recipe. Place cream, vanilla and rice malt syrup into a mixer bowl and beat on medium speed for 3-4 minutes or until the cream starts to form soft peaks. To serve- Place one cake onto a serving plate or cake stand. Spread with whipped coconut cream. Top with second cake, additional whipped coconut cream, blueberries, strawberries, fresh figs, or choice of seasonal fruits.